At the office the other day, we had a man who owns his own business come in, Nicolas Harman, who owns and runs Harman Window Cleaning. Rather than this post being an advertisement I want to extract a few aspects of his business so you can start your own business. I believe there are a few basic principles that I noticed in Harman’s business that you can apply to start your own business. 1. 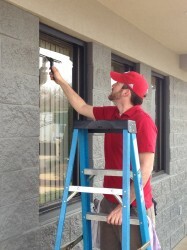 Honesty / Integrity – Harman is contracted to wash the windows at the office twice a year. This is not to say that some of the easier to reach windows aren’t cleaned by others a few times more than that per year. This would leave an opportunity for Harman to skip out on cleaning a select few windows that don’t look too bad. To successfully start your own business, you must be honest to a fault. Integrity is keeping your word, and doing the job you said you would do. Harman cleans every single window, not because he has to, but because his standards of quality are higher than any of his customers. 2. Know the customer – Every job is different; as is every customer. Harman doesn’t have to bring big ladders to our office because we have a scissor lift in the warehouse. Knowing the customer helps Harman save money and reduce cost to the client because he can use our existing equipment. When you have an opportunity to save the client money, at no cost to yourself, do it! This goes back to honesty and integrity, which is why honesty is the #1 principle I noticed in Harman’s business. Don’t be too set in your ways, that you can’t adjust for your customer’s individual needs. 3. Have a Professional Look – Harman’s appearance is professional. He doesn’t have a fancy uniform, but he does dress in a manner that shows he is serious about the job. He isn’t out in the sun to get a tan. Not all businesses are the same, and obviously the uniform should be suited to the job. Successfully start your own business by using this bit of common knowledge: “Dress for the job you want”. Dress to impress; for success. 4. Be personable – When Harman is working, he is personable. He will gladly answer questions about what he’s doing. Once the job is done, we will often go to lunch with him and talk about business, and how things are going. I think if customers can get you know you, they will have a deeper connection with you, and that can only lead to a stronger relationship. If you are friendly with the customers, they will have a stronger sense of loyalty to you. These have been a few things I’ve noticed about Harman’s Window Cleaning. I believe these principles are universally applicable to you to start your own business. If all businesses ran the Nick's does, the world would be a much better place to live. Proud of you Nic, great to see God blessing your efforts… your business is really growing, happy for you! What can I say son but how amazed and proud I am of you. Your dad would be too. What a great tribute to him that your work ethic matches his. Thank you for giving your life to our Creator in everything you do. Love you George!